Who could not resist this quilt titled Beginning True by Sue de Vanny. For me this quilt which received an Honourable Mention would have been the show winner. 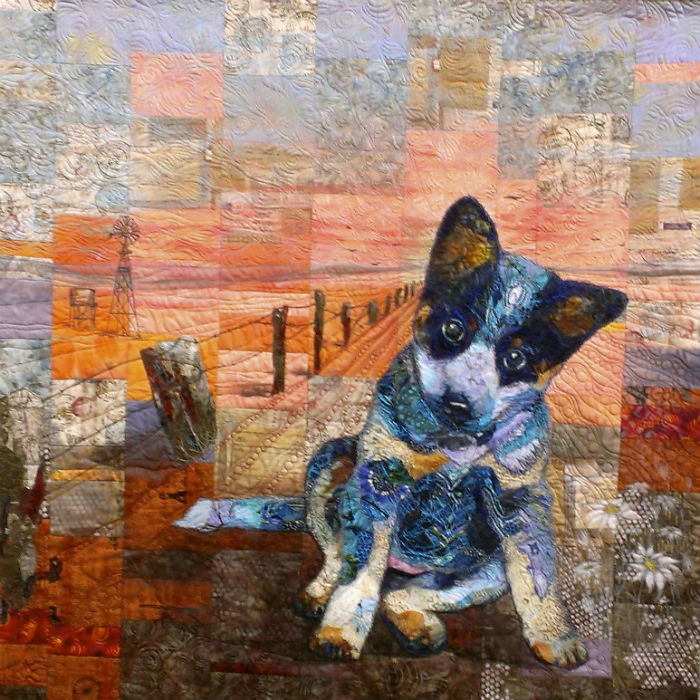 The quilt is part of an Australian Quilt Convention exhibit in the the 2015 challenge True Blue. For me it stole my heart so should have stolen the show as you can see Cute rules! I also like the colours and the subtle use of perspective with the depictions of the fence. You can see some of the quilts on the Australian Quilt Convention website. I wish there was a pattern for those of us who own and love these special, brilliant dogs!!! As the owner of several Blue Heelers over the years I love this and it reminds me of their adorable pup expressions! For reasons too emotional to explain, this is the one. A mate, a true blue, so important in an Aussie life and in my family. A beaut. This quilt reminds me so much of Texas (my home state). The colors and the also the Blue Heeler puppy. We have lots of those colors in nature here and lots of those dogs, as well. This quilt touches my heart. Thanks so much. Pinning! Oh! I agree with you! What a lovely piece of work. Just love this quilt!! The pup looks like he could walk right out of the quilt. Cute does rule! I couldn’t! 🙂 Just adorable and beautifully executed! I agree,this is a gorgeous work! Oh that is just the loveliest.